ORLANDO, Fla. (AP) If the Washington Wizards are missing All-Star point guard John Wall, they certainly aren’t showing it. Washington won its fourth straight game while Wall is sidelined because of a knee injury, pounding the Orlando Magic 115-98 on Saturday night. Tomas Satoransky, who replaced Wall in the starting lineup, had a career-high 19 points, six assists and wasn’t needed in the fourth quarter after helping the Wizards blow open the game in the third. Otto Porter led Washington with 20 points. Bradley Beal, who also sat out the final period, had 18 points, eight assists and eight rebounds. Marcin Gortat contributed 10 points and 11 rebounds, and Markieff Morris had 16 points as all five starters hit double figures. Washington had 35 assists in the game, while shooting 54.1 percent from the field. The Wizards used a 10-0 run the final four minutes of the first half and an 18-5 run in the middle of the third quarter to open a 23-point lead. Many of Washington’s baskets were layups after thread-the-needle passes in traffic or wide open 3-pointers when Orlando’s defense collapsed inside. Orlando was coming off one of its best performances of the season, a 127-105 rout of the Los Angeles Lakers. The Magic haven’t won two straight since Nov. 10 and didn’t look all that interested in changing that against the Wizards. After Washington’s third-quarter burst put Orlando in a 23-point hole, the Magic couldn’t get the lead under 17 the rest of the game. Jonathon Simmons and Mario Hezonja led Orlando with 15 points apiece. 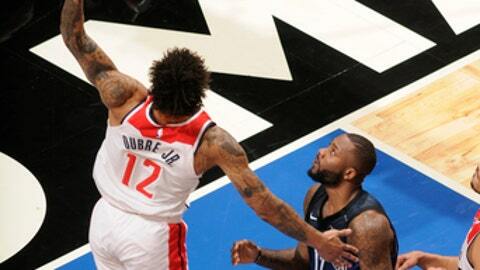 The Magic had seven players in double figures, including 14 from Elfrid Payton, but never seriously challenged the Wizards in the second half. Wizards: The Wizards are 14-5 when Beal has five or more assists. … Washington is shooting 89.3 percent (92 of 103) from the free throw line in the last five games. … The Wizards closed out the first half with a 10-0 run that gave them a 56-47 lead. Magic: PF Aaron Gordon, team’s leading scorer, thought he would return from a strained hip flexor, but couldn’t make it through Friday’s practice and missed his third straight game. . Marreesse Speights replaced Gordon in the starting lineup and had 10 points and two rebounds. . Hezonja is 10 of 14 (71.4 percent) on 3-pointers in his last three games. Wizards: Play at Indiana Monday night. Magic: Visit Miami on Monday night.